SMS Standard or SMS Premium, get the best prices you could find on the web. Many features in an easy and intuitive user interface. For developers of web sites, software or applications, get preferential rates by using the Octopush SMS API. Please reach the SMS API pageRendez-vous sur notre page API SMS to discover the documentation, and download source codes et sample files. Reliable interface which is easy to configure. It is very easy to send SMS with Octopush. Octopush guarantees the complete confidentiality of your lists. Create your lists and register your contacts in total confidence. For Octopush, the power of servers which enable SMS to be sent is a priority. More than one million SMS sent every month and thousands of satisfied customers. 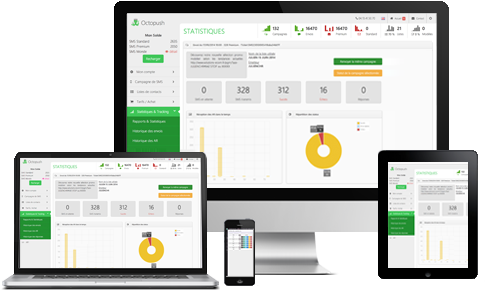 Octopush makes available all the tools required for tracking and analysing the SMS you send. An SMS dispatch service available in more than 220 countries. Take advantage of local prices to send SMS abroad. Download our documentation free of charge and automate the SMS you send from your own software solution. Our dedicated team responds to all your questions. Call us or request a call back; we are here to help. Take advantage of our experience! We support you in the preparation stage of your SMS campaign, from drafting the message to choosing the time to send the SMS. Mobile marketing has become the most powerful channel for a marketing campaign. The largest brands and companies of all sizes are now turning to mobile marketing. Octopush enables you to communicate with your customers in a personal and non intrusive manner, thereby generating unparalleled transformation rates and increasing attendance levels at your events almost immediately. An SMS is concise, easy to read, easy to memorise, easy to send and easy to store. All these advantages contribute to making the SMS campaign the most powerful marketing solution. Octopush is offering a professional solution in SaaS (Software as a Service) mode to sendSMS which do not require any software to be downloaded. The ergonomics of the bulk SMS gateway mean that no training is necessary. We have taken care of our interface by using new generation smartphone navigation codes. Possession is taken immediately. The platform used to send SMS in bulk as offered by Octopush is a proprietary, robust and tested solution. Octopush manages the service to send SMS in bulk, at volumes of several million SMS per month. Among the customers that have trustedOctopush, and who continue to do so, you will find key accounts, SMEs, TBPs, associations and many agencies in France. Agreements with more than 150 operators enable optimum delivery for your SMS at a national and international level. The solution Octopush of sending SMS in bulk provides you with the highest quality of service. An SMS campaign costs on average 10 times less than a paper or telephone contact marketing campaign. Mobile Marketing is effective: 95% of SMS are read within 15 minutes of being sent. Sending SMS is a global activity: 99% of the French population has a mobile phone. An SMS campaign is profitable: 17% transformation rate with marketing SMS campaigns. Sending SMS is a medium in its own right: a PewInternet survey shows that 31% of people who use a mobile phone prefer to receive a text message/SMS rather than a telephone call or a voice message. The Octopush team has a total of more than 20 years΄ experience in mobile marketing. Our marketers are at your service 7 days a week from 9am to 7pm to provide you with ongoing support during the setup of your SMS campaign. You already use e-mailing, phoning or flyer-related techniques to provide information about your marketing activities. Diversify your communication channels by adding the option to send SMS, the most powerful channel of our generation. Reduced creation costs, unbeatable dispatch costs, unparalleled effectiveness. Hesitate no more and choose the SMS dispatch service for your marketing campaigns!